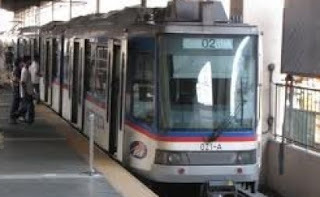 An unidentified man jumps on Metro Rail Transit's Guadalupe station train tracks Wednesday morning, May 8, 2013, committed suicide, according to report by the InterAksyon site. According to MRT and the Department of Transportation and Communication, it was confirmed as suicide and it happens around 8:15 a.m.
Due to this incident, MRT operation have been suspended and forcing other passengers to alight from the train and walked along the rail tracks. The DOTC's official Twitter account (@DOTCPhilippines) tweeted that the trains are running only between the North Avenue and Shaw Boulevard stations and the "provisional operation" would be in effect "until further notice." For the meantime, if you like the information about Man jumps on MRT train tracks, please bookmark this page and share it to your friends on Facebook, Twitter and Google+. Comments or suggestions about "Man Jumps on MRT train tracks in Guadalupe" is important to us, you may share it by using the comment box below.